Comments: Mandalorian supercommando Fenn Shysa struggles to free Mandalore from the grip of slavers. His close friend Tobbi Dala has been captured by the slavers, but Shysa has someone they want even more: the bounty hunter Dengar. Princess Leia needs Dengar for her own reasons: he can lead her to Boba Fett, who is holding the carbonite-frozen Han Solo. But Shysa's not about to let her stop a prisoner exchange that will free his friend. 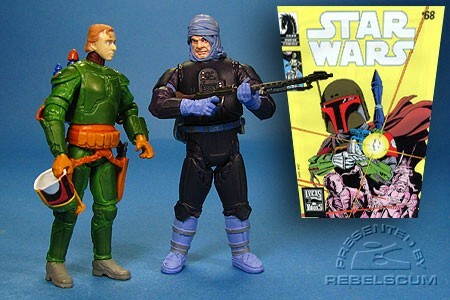 Fenn Shysa is based on the figure from 2007's TAC The Fett Legacy Evolutions set. The body has been repainted, and this figure has a new head. Dengar is a repaint of 2004's SAGA Dengar (Executor Meeting). For more information on the Marvel Comics Star Wars comic book series, check out our cover gallery.